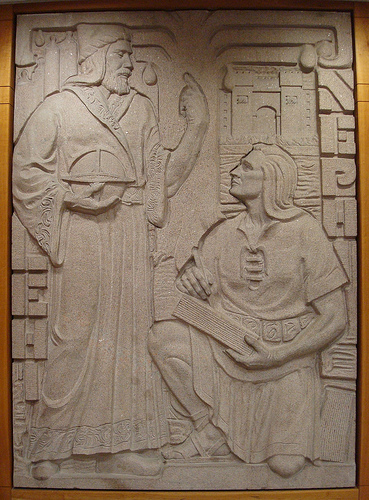 "Lehi-Nephi" by Dr. Avard T. Fairbanks at Harold B. Lee Library, BYU. Photograph Matt Beatty. Used with permission. Lehi and Nephi, father and son, were Book of Mormon prophets. In the Book of Mormon of The Church of Jesus Christ of Latter-day Saints, Nephi is a prophet/historian. He was the son of Lehi and Sariah who lived in Jerusalem approximately 600 B.C. under the reign of King Zedekiah. At that time, the family included three other brothers (Laman, Lemuel, and Sam. Nephi’s father had a vision in which he learned that Jerusalem would be destroyed, if the people did not repent. Lehi warned the people, but instead of listening, they sought to take away his life. Because of this, God instructed Lehi to take his family and escape into the wilderness. While on their journey in the wilderness, Lehi had a particular vision of the Tree of Life which he then recounted to his family (see 1 Nephi chapter 8). Nephi wanted to understand the visions his father was having, so he prayed to the Lord and received confirmation that his father was indeed a prophet. The Lord showed him the same vision of the Tree of Life and explained the meaning of the vision. Nephi was obedient to his father and to God. This obedience later made him a great prophet and leader. With help from God through a compass known as the Liahona and revelation, Lehi’s family traveled to the Promised Land, now known as the Americas. After the death of Lehi, Nephi’s two eldest brothers wanted to kill him, so following commandment from God, Nephi left in the night with his family and all who would follow him. Those who followed him wanted Nephi to be their leader. He consented and his people became known as the Nephites. The people loved Nephi so much that the following leaders of the Nephites were called 2 Nephi, 3 Nephi, and so on. His brothers' families and followers called themselves Lamanites. Throughout the Book of Mormon the Lamanites and Nephites were at war with each other, though there were times of peace. ...that I might more fully persuade [my brothers] to believe in the Lord their Redeemer I did read unto them that which was written by the prophet Isaiah; for I did liken all scriptures unto us, that it might be for our profit and learning (1 Nephi 19:23). Over a thousand years after Lehi and his family left Jerusalem, two descendants of Nephi finished the record he had begun. Their names were Mormon and his son Moroni. Behold, I have given unto you the names of our first parents who came out of the land of Jerusalem; and this I have done that when you remember your names ye may remember them; and when ye remember them ye may remember their works; and when ye remember their works ye may know how that it is said, and also written, that they were good. Therefore, my sons, I would that ye should do that which is good, that it may be said of you, and also written, even as it has been said and written of them (Helaman 5:6-7). Nephi, son of Helaman, was a great prophet and a great missionary. He helped bring the gospel to many Lamanites and was given great power from the Lord. Nephi's son was also named Nephi. He too was given great power from the Lord. During the visitation of Jesus Christ to the Americas, Nephi was appointed as one of the twelve disciples who would oversee the church in that land. This page was last edited on 17 September 2010, at 08:02.